Lee Corso, Lou Holtz, and accountability. Been a while since I wrote. Back when I began writing, Karen's house had burned down. Since then, there have been virtually no hurricanes in the Atlantic. Pam and Jim finally got together on the Office. Notre Dame has become one of the worst football teams in the country...and Kentucky is in the national title hunt with a 6-1 record. I know, I know--at some point we need to buy a harness for all these flying pigs and use them for transportation. But seriously, it's a great feeling. It has also lead me into a very unfamiliar area of college football--the inner workings of the polls and commentators. Now there are things that I knew already existed, like the fact that Ohio State plays no one and somehow gets annointed as a great team. (and where is their amazing QB at nowadays). Every year, the Big Ten is deemed a great conference when it is mediocre at best. What I hadn't seen yet is why everyone hated Lee Corso, Lou Holtz, and various other college pundits and talking heads; now I totally see why. ...AND for the most part, it is not because they are stupid. No seriously, Lee and Lou know their stuff (I'll get to the stupid stuff later). But watch this clip from the great USC website, letsshowcorso.com. Lee pretty much got punked on that one, and rightfully so. But it happens to all of us! We all make picks and predictions like that. What bothers me is how offended the little guy gets when someone dares to hold him accountable for it. 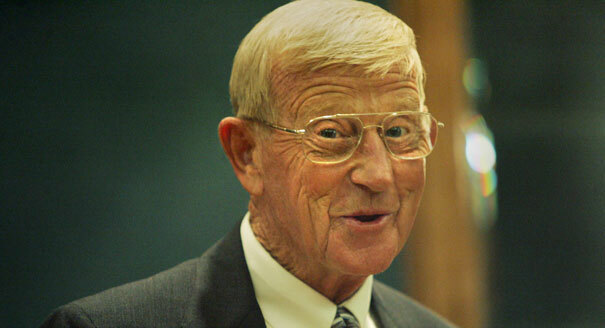 Here is another classic, this time involving Lou Holtz. Now I know everyone likes to say he's losing his mind, but listen to the guy when he actually gives stats. He knows his stuff. But when he starts picking only the teams he coached to win (including Notre Dame EVERY WEEK) and making outlandish statements, that's where things get worse than that awful lisp he has (though I would relish one day hearing him say "sufferin' succoatash"). Earlier, after again picking Notre Dame to win and again watching them lose (to a mediocre Purdue team), he explain that their improvement in that particular game meant they could compete with anybody. Crazy? Maybe. But he has a point--there is a reason we play the games on the field and not on paper. Any of you LSU fans know that real well after this past Saturday. But here, the logic that he laid down for Notre Dame having a chance against anybody doesn't seem to hold true with Auburn (a great road team that proved it could beat Florida last year). Well, we all know how that turned out. (Joe has a great picture for Lou's campaign). At least Lou had a little fun with it. But seriously, what the heck was that? Here is the final one that will really set off all you fellow Kentucky fans. This idiot (Craig James) has UK as the #24 team in the country...after beating #1 ranked LSU on Saturday. He has Cincinatti, who lost to Lousiville, ahead of us. THESE GUYS ARE PAID TO DO THIS!!! They are paid to analyze college football and they are making idiots out of themselves. I could give you tons more Corso and Lou examples, but Karen gets on to me about ranting too much when I write, so I'll let you find the youtube goodness. But to paraphrase Marie's soon to be husband, James: "Nick, when it comes to the polls, [screw] 'em. All that matters is winning games." Right on, James. Kentucky vs. Florida this weekend---GO CATS!! !